Dear boys and girls, welcome! I thank you for your festive welcome. I thank your Bishop for his introduction and the people who accompanied you on this pilgrimage. Thank you all! I was struck by the words of that young man whom the Bishop quoted a while ago - and whom I already knew from before -: "Do the bishops really believe that young people can help the Church change?". I do not know if that young man, who asked this question, is here among you ... Is he here? ... There is not, all right. But in any case I can tell him and all of you that this question is very dear to me too. 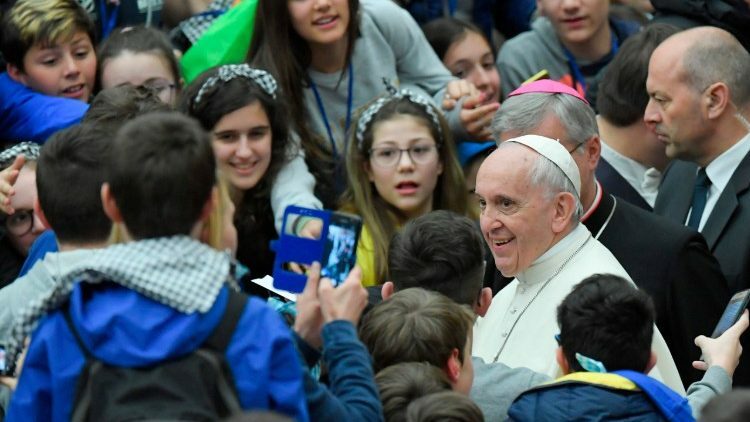 It is very important to me that the next Synod of Bishops, which will concern "Youth, faith and vocational discernment", is prepared by a real listening to the young. And I can testify that this is being done. You also demonstrate this to me, with the work that is going on in your diocese. And when I say "true listening" I also mean the willingness to change something, to walk together, to share dreams, as that young man said. But I, too, have the right to ask questions, and I want to ask you a question. You rightly ask yourself if we bishops are willing to really listen to you and change something in the Church. And I ask you: are you willing to listen to Jesus and change something about yourself? I leave the question to enter your heart. I repeat: are you willing to listen to Jesus and change something about yourself? If you're here, I think it's like that, but I can not and I do not want to take it for granted. Each of you reflects us within himself, in his heart: Am I willing to make my dreams come true to Jesus? Or am I afraid that his dreams can "disturb" my dreams? And what is the dream of Jesus? The dream of Jesus is what in the Gospels is called the kingdom of God. The kingdom of God means love with God and love among us, forming a large family of brothers and sisters with God as Father, who loves all his children and is full of joy when one is lost and returns home. This is Jesus' dream. Ask: Are you willing to do it yours? Are you willing to do it yours? Are you also willing to change to embrace this dream? [The boys answer: Yes!] All right. Jesus is very clear. He says: "If one wants to come after me - that is, with me, behind me - deny himself." Why does he use this word that sounds a little ugly, "deny oneself"? Why? In what sense should it be understood? It does not mean to despise what God himself has given us: life, desires, the body, relationships ... No, all this God has wanted him and wants him for our good. Yet Jesus asks those who want to follow him to "deny himself", because there is in each of us what in the Bible is called the "old man": there is an "old man", a selfish ego that does not follow the logic of God, the logic of love, but follows the opposite logic, that of selfishness, of doing one's own interest, often masked by a good facade, to hide it. You know all these things, they are things of life. Jesus died on the cross to free us from this slavery of the old man, who is not external, is internal. How many of us are slaves of selfishness, of getting attached to riches and vices. These are the internal slavery. It is sin, which makes us die inside. Only He, Jesus, can save us from this evil, but we need our collaboration, that each of us says: "Jesus, forgive me, give me a heart like yours, humble and full of love". This prayer is beautiful: "Jesus, forgive me, give me a heart like yours, humble and full of love". This was the heart of Jesus. So he loved Jesus. This was how Jesus lived. You know? Such a prayer, Jesus takes it seriously! Yes, and those who trust him give surprising experiences. For example, try a new joy in reading the Gospel, the Bible, a sense of beauty and the truth of his Word. Or feeling attracted to participate in the Mass, which for a young person is not very common, is not it? Instead, one feels the desire to be with God, to remain silent before the Eucharist. Or Jesus makes us feel his presence in the suffering, sick, excluded people ... Think about what you felt when you did something good, in helping someone. Is not it true that you heard a beautiful breath? This is given by Jesus. It is He who changes us, it is just like that. Or he gives us the courage to do his will by going against the current, but without pride, without presumption, without judging others ... All these things are his gifts - they are his gifts! - that make us feel more and more empty of ourselves and more and more full of Him. The saints show us all this. St. Francis of Assisi, for example: he was a young man full of dreams, but they were the dreams of the world, not those of God. Jesus spoke to him in the crucifix, in the little church of San Damiano, and his life changed. He embraced the dream of Jesus, stripped of his old man, denied his egoistic self and welcomed the self of Jesus, humble, poor, simple, merciful, full of joy and admiration for the beauty of creatures. And we also think of Giovanni Battista Montini, Paul VI: we are accustomed, rightly, to remember him as Pope; but first he was a young man, a boy like you, from a country on your land. I would like to give you a task, a "homework": discovering Giovanni Battista Montini as a young man; as he was in his family, as a student, as he was in the oratory ...; what were his "dreams" ... Here, try to find this. Dear boys and girls, I thank you for this visit, which gives me joy, so much joy. Thank you! May the Lord bless you and may the Madonna accompany you on your journey. Life is a journey! You have to walk ... And I recommend: do not forget to pray for me. Thank you! And now I would like to give you the blessing, but first let us pray to Our Lady together: "Hail Mary ...".